Every day, thousands of engaged couples and newlyweds find themselves in a predicament: They have all the cutlery, bath towels, photo frames, and kitchen gadgets they need. Wedding guests, however, are stubbornly addicted to gift registries. They love the safety of registries, knowing that they’re giving the happy couple something that suits their tastes. Guests also appreciate the convenience of shopping online. The problem becomes: how to provide guests with a registry, without inviting a flood of unwanted stuff. Many engaged couples are solving this dilemma by turning to online honeymoon registries, where guests can contribute to the expenses and activities of a post-wedding trip. Creating the honeymoon registry was by far the most enjoyable part of planning the wedding. My husband and I were thrilled to discover the endless possibilities of a honeymoon registry. We’ve always connected with each other through travel and outdoor activities, and our guests were, for the most part, like-minded souls. In fact, creating the honeymoon registry was by far the most enjoyable part of planning the wedding. After months of deliberation, mind-changing, and scanning discount airline websites for good deals, we finally decided to spend our honeymoon traveling through the National Parks and monuments of Southern Utah. After we chose our destination, the next step was to find a registry that would enable our guests to contribute to our adventure. There are many options for online honeymoon registries, and they all offer slightly different services. Do your homework to find a reputable site; these are usually designated as members of the “Better Business Bureau’s Online Reliability Program,” meaning that they are accountable to an outside agency and are therefore less likely to disappear with your guests’ donations. Most services allow you to set up a honeymoon webpage for your guests to visit, send out registry announcements by email or regular mail, and keep the donations in an insured bank account until you’re ready to “cash in.” They make their money by charging either you or your guests a service fee, usually a fixed percentage of each gift, though some depend on advertising revenue. Other sites also offer travel agency services, allowing you to book hotels, airlines, and tours through their agents. Popular services include HoneyLuna, Traveler’s Joy, Honeyfund and The Big Day. Sites like Honeyfund are free, stripped-down services which allow you to create a basic registry, while those like HoneyLuna will research your destination, write descriptions of your items and activities, and book your travel. Each is a slightly different service, so be sure to read the fine print to find the one that best meets your needs. We chose Traveler’s Joy because we wanted to book the travel ourselves, and the service fee they charged (7.5%) was smaller than many others. The fee was also not visible to gift givers at checkout – it was subtracted from the final check sent to us before we departed on our trip, so there was no charge to our guests beyond the item they selected. We were also careful to look at a number of registries other couples had already created on the site, and to see what kinds of items or experiences were fulfilled and what had not been purchased. We noticed that the most successful registries were those that included a wide variety of price points, so guests on any budget could find a gift that suited them. The less successful registries tended to be either too frivolous or too boring. One couple, to my amazement, registered “100 margaritas” for a five-day trip to Cancun (an astonishing 10 margaritas each per day), which guests did not purchase. Another oft-ignored item was airfare, which suffers from a lack of romantic appeal. An airline ticket isn’t as exciting or unique as a night in a luxury rain-forest bungalow or dinner at a romantic restaurant. The type of gifts most popular with guests were experiences that the couple would remember: a hot-air balloon ride, a guided kayaking trip, a sunrise picnic, or a bottle of wine to share on the beach at sunset. These types of concrete experiences help guests feel like they are giving you a truly memorable gift, rather than just giving you money. I think our honeymoon registry allowed our guests to become a part of our trip. We tailored our registry to suit the friends and family who generously contributed to our trip. Our more adventurous guests gave us a guided day of rock-climbing near St. George, Utah, a scenic mule ride in the Grand Canyon, and a power boat rental to cruise the sparkling waters of Lake Powell. More traditional guests provided a post-hike massage at a spa in Zion National Park, handcrafted Navajo pottery from a shop in Moab, Utah, and a gourmet picnic dinner to share at Cedar Breaks National Monument. Guests on a budget were able to help out with campfire s’mores, a hearty pancake breakfast, and a collection of National Park postcards. The registry was so popular that we received all but three of the items we requested, and we thanked our guests by enclosing photos of our adventures in thank you cards. Some guests might balk at first at the idea of a travel registry, thinking that it’s not traditional enough. 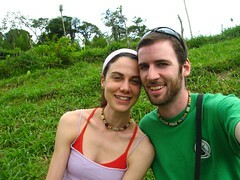 However, I think our honeymoon registry allowed our guests to become a part of our trip. To combat the mentality that frowns at a honeymoon registry, be sure to discreetly spread the word about why you’ve chosen this unconventional option. While it’s true that a china place setting is more permanent than a night at a Grand Canyon lodge, the memories you create on a honeymoon will last for a lifetime. After all, once you’re back in the 9 to 5 routine and the confines of cubicles, you will daydream about the hike to Delicate Arch or the snorkeling in Hanauma Bay, not about silver napkin rings. Make the case in these terms, and even Grandma will soon be won over. Haley January Eckels studied history and English literature at McGill University in Montreal, Quebec, graduating in 2004. She is based in Manchester, New Hampshire, and works as a writer and editor. Her overseas adventures have included a 750-kilometer pilgrimage in Northern Spain and a volunteer teaching position on Kili Island in the Marshall Islands. When she’s not reading, writing, or traveling you can find her climbing the local cliff or hiking in the White Mountains.